The use of a low-level double is a request to partner to bid an unbid suit. The most common instance is after a one-level bid by an opponent. 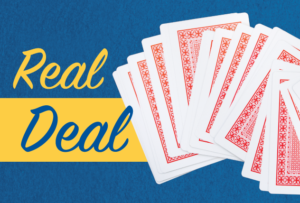 The double normally indicates a hand worth an opening bid with at least three-card support for all unbid suits. Knowing the proper responses after partner doubles is crucial. You should look first to play in one of the major suits. The second choice is notrump. If either of these is not a good option, then you should play in a minor suit. ♠10 8 4 3 ♥Q 4 ♦10 4 3 ♣J 7 6 4. Bidding 1♠ doesn’t promise values since partner forced you to bid. Bid 1NT with a relatively balanced hand and 7–10 HCP. Here is an example:♠K 10 3 ♥Q 4 ♦Q 10 4 3 ♣J 7 5 4. Although 7–10 HCP is recommended here, the exact strength is a matter of style, and expert opinions vary. The conservative view is to use the bid for 7–10 or 8–10, but others recommend 6–9 or even 5–10. As with many bidding situations, this is something you and your partner should discuss. You should not bid 1♥ — you are too strong. You should jump to 2♥, a bid that is invitational. Partner can pass if he has a minimum takeout double. If he has 13 points and you have 10, that’s not enough for game. If he has extra, he can bid again. ♠A 3 ♥J 5 3 ♦K Q 10 4 ♣J 10 7 4, you should bid 2NT. 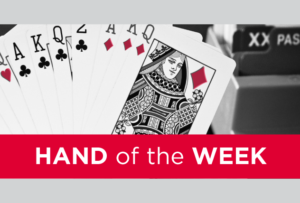 The hand is too strong for 1NT and you don’t have a four-card or longer major. Try to play notrump instead of a minor suit when you have a hand this strong. 2NT shows your strength and approximate pattern and allows partner to make a good decision. Cuebid the opponent’s suit with 12 or more HCP. If you and partner both have opening bid values, you probably have game. You send this message to partner with a cuebid. Suppose you have:♠A 6 ♥Q J 5 3 ♦K Q 7 4 ♣J 10 5 3. Should you play game in 3NT or 4♥? If partner has a four-card heart suit, you would want to play 4♥. 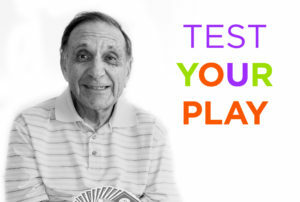 If partner only has three-card heart support, then you want to play 3NT. Since you are not sure, cuebid 2♦. If partner rebids 2♥, you can raise to 4♥. If partner bids something else, you can bid 3NT. Jump to the three-level with a long suit with good playing strength, but less than game values. You hold:♠K J 10 8 7 4 ♥9 ♦5 4 ♣Q 10 9 4. Bid 3♠. Your hand has too much potential for a simple 1♠ bid, but doesn’t qualify for a 2♠ bid with only 6 HCP. Bidding one more than a single jump shows you have a long suit and some useful points. Partner can evaluate his hand to decide whether to continue to 4♠. Here are some more examples. In each case, suppose your LHO opens 1♣ and partner doubles. ♠8 5 3 ♥K Q 3 ♦9 4 3 2 ♣7 4 3? Answer: Bid 1♦. Yes, your suit is weak, but you are forced to bid and it’s the only four-card suit you have. ♠8 4 ♥Q 8 4 3 ♦10 8 3 ♣A K 4 3. Answer: Bid 2♥. It’s true your hearts are only four cards long and not very strong, but bidding 1♥ does not show the strength of your hand. Partner usually has four-card heart support, so jump to 2♥ and hope for the best. ♠10 7 ♥K 8 3 ♦K Q J 10 7 ♣9 7 5. Answer: Bid 2♦. You don’t have a four-card major to bid. You don’t have a club stopper. That leaves bidding diamonds. Jumping to 2♦ promises diamonds and 9–11 (or a good 8) points, which is a good description of your hand.